Blacklisted workers have launched a fightback against the building contractors who stopped them working because they stood up for workers’ rights and health and safety, with a £600m High Court claim. A group of 86 trade unionists are fighting a blacklisting system that has gone on for decades, with a case launched in the High Court last week. The High Court fight centres on a claim against building giant Sir Robert McAlpine for what is known in law as ‘Tort of unlawful conspiracy’. The claimants are part of the Blacklist Support Group, a network of construction workers who were illegally blacklisted because of their trade union activities by major building contractors. The contractors used a blacklisting outfit known as the Consulting Association. The claim targets Sir Robert McAlpine as the company with the worst record of blacklisting – the last invoice issued to them by the Consulting Association was for more than £28,000 for blacklisting services. But the conspiracy charge means McAlpine would also be responsible for the actions of more than 40 other contractor firms such as Carillion, Balfour Beatty and Skanska that systematically blacklisted trade unionists. This nearly ruined my marriage and it meant that my children were on free meals at school. My file goes back to 1964 and the last entry says that I rekindled the campaign for justice for the Shrewsbury picketers in 2006. They have been watching me all these years and passing this information around, blighting my life over four decades. The powerful video above, made by the Blacklist Support Group and Reel News, reveals how workers were repeatedly sacked, with many suffering long years of unemployment. In the court case, the claimants will seek compensation or loss of earnings and the distress caused. If they win, total payments to a possible 3,200 blacklisted workers could top £600m. I was blacklisted because I was a union member and because I raised issues about safety. 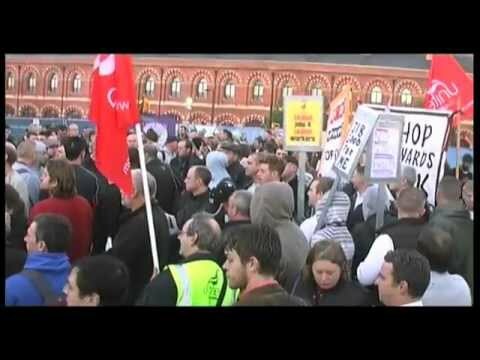 In 2007, McAlpine sacked me from the Colchester Barracks project after two days for refusing to work on a moving platform without proper training (exactly as we had been instructed in the site induction) – the dismissal is recorded on my blacklist file. Over the year I suffered severe financial strain, my wages were cut in half which caused immense stress paying bills and putting food on table. I was out of work for a year apart from few weeks here and there in 2001. Being sacked from Colchester Barracks after only two days piled up the stress and caused a nervous break down for me eventually. The blacklisting firms should be made to pay compensation for years lost and years in future. They should be made to employ blacklisted workers or not be awarded any public government backed contracts. An apology in national press and to individuals whose lives they ruined would be a start. For more information, or to ofer support to the blacklisted workers, email the Blacklist Support Group. Scumbags – need I say more! we need to support blacklisted brothers & sisters whenever, whereever & however we can & highlight employers cavalier attitude to the welfare of employees. These corporations & contractors are involved in a myriad of business sectors and organisations and we should all pressure our own employers (is it worthwhile pestering politicians about this…?) not to do business with them.